Karaite Judaism or Karaism יהדות קראית , meaning “Readers (of the Hebrew Scriptures)”) is a Jewish movement characterized by the recognition of the Tanakh alone as its supreme legal authority in Halakha (Jewish religious law) and theology. It is distinct from mainstream Rabbinic Judaism, which considers the Oral Torah, as codified in the Talmud and subsequent works to be authoritative interpretations of the Torah. Karaites maintain that all of the divine commandments handed down to Moses by God were recorded in the written Torah without additional Oral Law or explanation. As a result, Karaite Jews do not accept as binding the written collections of the oral tradition in the Midrash or Talmud. When interpreting the Tanakh, Karaites strive to adhere to the plain or most obvious meaning (“peshat”) of the text; this is not necessarily the literal meaning, but rather the meaning that would have been naturally understood by the ancient Israelites when the books of the Tanakh were first written. . . . Karaite Judaism holds every interpretation of the Tanakh to the same scrutiny regardless of its source, and teaches that it is the personal responsibility of every individual Jew to study the Torah, and ultimately decide for themselves its correct meaning. If you are familiar at all with certain trends in the Messianic Jewish Movement, you will recognize the close affinity those trends have with Karaism. Much happening in and around the Messianic Movement might be termed either Messianic Jewish Karaism or Messianic Jewish Protestantism, not in the sense of Christian Protestantism, but in the sense of being a protest against rabbinic authority. The latter metaphor highlights how some Messianic Jews view the rabbinical establishment as some sort of Jewish papacy with its own canon law, from whose control these Messianic Jewish Protestants seek deliverance through recourse to the Bible as the supreme and sole authority. So here we are: something very like a Messianic Jewish Karaism, a.k.a. Messianic Jewish Protestantism, a back to the Bible movement rejecting the authority of the rabbis and of rabbinic Judaism. One more metaphor: such people are purists, with an intense fixation on what is best termed “purism,” who break away from other groups deemed insufficiently faithful to an identified list of commitments or deemed contaminated by unsavory associations. Purists. Protestants. Karaites. Hallelujah? Or oy gevalt? I can say “Hallelujah” to the unique authority of the Bible and to the unique delight I have always had in studying it. There is nothing that compares. Yes. But yet, in some ways I opt for “Oy gevalt.” But why? First, purism, Karaism, such Messianic Jewish Protestantism is endlessly schismatic. Such groups split off, then split again and again as adherents pursue an idealized religious culture meeting their ever deepening standards of purist perfection. Look at the history of such groups and what you will see is the disruption and destruction of community in the name of doctrinal fidelity. I remember once doing a concert at a Southern Baptist church somewhere, where, during the time when visitors were invited to introduce themselves, a man stood up in the congregation from a new Independent Baptist Church in town. He spoke out and invited the people present to come to his church instead, “to hear the gospel really preached.” Such chutzpah. But he was a purist, looking for more purists, so that together they could form the purest church in town, which would certainly also suffer a split from those seeking greater purity somewhere down the line. Meanwhile, he was heedless that he was seeking to steal sheep from this Southern Baptist Church, disrupting community in the name of purity. I guess all’s fair in love, war, and doctrinal earnestness. Many years ago, theology professor Robert Webber stood up in the Chapel at Wheaton College on a Reformation Sunday and declared that the Reformation was one of the worst things to ever happen to the Church! I am sure hearts stopped beating at that moment. His reason? Because by breaking away, the Protestants began a process of fragmentation that continues to this day, 500 years later. He suggested, and he is not the only one, that it would have been far better for the Reformers to stay in the historic church and to be patient agents for change, to the degree that this continuing engagement was possible. Splitting off for the sake of greater purity? Driving a wedge into the block of communal cohesiveness results in a never-ending process of communal fragmentation. If you don’t believe me, step back and look at Protestantism. What hath Luther wrought? Second, such purist Karaites form small groups that tend to get smaller with the passage of time. There was a time when there were quite a few Karaites, but such groups tend to shrink, and this one did. This is because the less than truly pure need to be pruned away or just drop out, and the number of people who want to join a high demand purist group is by nature small. So while some are lost, it is difficult to add others. And where you have more subtraction than addition, you have a shrinking community. You don’t believe me? Think of the Amish. 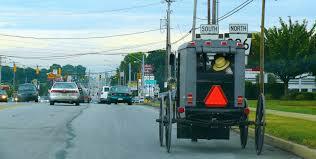 Everyone admires the Amish but who joins them? And many fall away. Still the group remains pure, the purest of the pure. Third those Messianic Jews who may be compared to Karaites and Purist Protestants deceive themselves, thinking they believe in the Bible and nothing else but, but of course this is not true. It is never true. None of us just believe the Bible. Instead we believe what we say about the Bible, what we have been told about the Bible, and the kinds of things our crowd approves being said about the Bible and what it says and means. Some of you don’t believe me when I say this. Here: prove it to yourself. Ask a dyed in the wool Dispensationalist to look at the Bible apart from his Dispensationalist grid. He won’t do so, because he doesn’t simply believe the Bible: he believes his grid about the Bible. And so with just about any other group you could name. And that, my friends, is Oral Law, a big bugaboo for Karaites and purists. But Oral Law is inevitable whenever and wherever you have a community that discusses, “Now how are we going to do this?” While I do not validate some arguments in the Jewish community concerning the Oral Law’s genesis, it is only rational to agree on its inevitability. It could not be otherwise. We must remember too that until the 15th century, manuscripts of sacred texts were rare. People did not carry around their BIbles, of course. Everything was oral! Fourth, Karaites (and Protestants) developed their own Oral Law, their own traditions. It is inevitable because it is human. So just as in the Reformation the choice being made was to jettison the tradition of the Roman Catholic Church for other traditions and ways of doing things, so has the impact of this kind of purist Messianic jewish Protestantism/Karism been to jettison the tradition of the Jewish people for a tradition of one’s own. But is this a good thing when it involves fragmenting and departing from the Jewish community and heritage in some manner? Learn the joys of staying engaged with a less than perfect community, prayerfully, humbly, sacrificially, and courageously seeking to be agents for change. The alternative is to break away from the Jewish world, to turn away from it, and to start a new game. But if we are the remnant of Israel, we should be the remnant within Israel, and not the remnant outside of Israel. I consider it both a scandal and a sin for Messianic Jews to separate themselves from the Jewish community, although I am not naive about how we get excluded as well. But let us NOT exclude ourselves! Realize that an obsession with doctrinal purity is a delusion. You are never as pure as you think you are. Even the Apostle Paul said, “we know in part and we prophesy in part . . . we see through a glass darkly.” The Torah reminds us that “the secret things belong to the LORD our God but the things that have been revealed belong to us and to our children that we may observe all the words of this Law.” There are things we are not given to know. We see things indistinctly, We only have part of the picture. Our vision and our doctrine is not and cannot be as pure as we like to imagine it to be. So be satisfied with being human, with being humble, and with being in respectful interaction with others, who like you, are stumbling toward the New Jerusalem. “As far as in you is, live at peace with all men.” Stay engaged as much as possible, respectfully, knowing that each of us can learn from the other. Consider whether it is sensible to believe that Yeshua. the Son of David, came so that we might dismantle the Jewish people. Should we not instead be a force for renewal within the Jewish people, and in that sense more like the Hasidic movement than the Karaites? (And yes, I know that the Hasidim were put under the ban by the Vilna Gaon, that is, that they were declared heretics. But again, I am speaking of how we see ourselves with relation to the Jewish community, and not simply how the wider Jewish community sees us). Realize how fallacious it is to imagine that God and His sovereign control has been evicted from the Jewish community for the past two thousand years, as though God could not and has not exerted any superintendence over developments there. God has been at work behind the scenes, and the Messah’s purposes have moved forward in and yes, through Israel, from which he has not been exiled any more than the most grievous errors of Joseph’s brothers thwarted God’s sovereign and saving purposes for Israel through that Joseph who had been given up for dead and yet lived at the right hand of power. I challenge you to widen your imagination, and to resist small minded provincialisms as untrue to the Bible and unworthy of God. Or, you can form a nice, pure, schismatic group, even a group of one, and play your role in the disassembling of the Jewish community. Some seem satisfied and think themselves anointed to do just that. But I hope that’s not you. Nothing in this article should be taken as a form of name-calling and label-affixing. I am here drawing a parallel with various historical streams, but people in the Messianic Jewish Movement may call themselves what they choose. I am not seeking to label them, but to draw parallels and to cast some light on the state of affairs. Brilliant! The number one sin of mankind is that we are endlessly religious. I have also found that the bane in MJ is provincialism. It creates self importance and sectarianism at the expense of the Kingdom which invites us to stand within the entire world, not our own self defined and authenticating one. Bravo Stuart! This is a wonderful article that needed to be said. In this section, it is also probably implied here is to not separate ourselves from the Messianic community :). One of the key inherent challenges here is figuring out how to fellowship with the people in our various communities we are apart of. Whether they be Messianic or Non Messianic whilst maintaining and having dignity in own unique identities, practices and beliefs. What is healthy separation? What is too much? How, when, why? etc I believe that what also makes this harder is being a younger person amongst elderly people or family members and not really having your positions taken seriously. I don’t want to wait for my family and older community members to pass on before I get to be the person I want to be. It is tempting or seemingly easy to break away, especially when your position is not accepted or promoted, so I do appreciate the encouragement to stay in community. Ultimately, even if no one changes or it takes a lifetime for someone to change, part of practicing Kiddush Hashem is following the calling you are supposed to be called to in all the different challenging areas of life. Being a light to others essentially. This is especially what believers and the Jewish people are supposed to be doing. I can empathize with Jewish people who do are insular, limit their light and put a fence up because of persecutions and bad theology due to not accepting Yeshua. The issues of fear and persecution can persist for pretty much anyone. I am dealing with some of this myself but I know through continual prayer, learning, good communication and wise judgement in practice, I will overcome and we will overcome. Thanks for writing this article, I have been thinking of this, and I am almost sure you thought of me a some point when devising this. You said “Realize that an obsession with doctrinal purity is a delusion. You are never as pure as you think you are. Even the Apostle Paul said, “we know in part and we prophesy in part . . . we see through a glass darkly.” The Torah reminds us that “the secret things belong to the LORD our God but the things that have been revealed belong to us and to our children that we may observe all the words of this Law.” There are things we are not given to know. We see things indistinctly, We only have part of the picture. Our vision and our doctrine is not and cannot be as pure as we like to imagine it to be. So be satisfied with being human, with being humble, and with being in respectful interaction with others, who like you, are stumbling toward the New Jerusalem. “As far as in you is, live at peace with all men.” Stay engaged as much as possible, respectfully, knowing that each of us can learn from the other. I have been taught this metaphor before and I appreciate the reinforcement on remembering that we see through a glass dimly and that we should be humble in our endeavors. Sometimes even taking a back seat or start at the back of the room and working our way to the front is whats needed. Part of accepting our humanness has to do with remembering to love your self first. Practice chesed towards yourself first and then as an outgrowth to others. Also important here would be to remember that in believer, non believer and other communities there are always people at different stages of growth and learning, or even with different beliefs and we shouldn’t discount them for not being “on par” or accepting everything we believe. As Doniel Hartmen says, we have a mitzvot consciousness and an people of Israel / Messianic (Messianic, being my addition) consciousness. My encouragement to myself and to anyone reading this is that even if we disagree on the mitzvot consciousness, lets not forget the peoplehood consciousness that we are all Am Yisrael. I would add here that for my life it has been important to have an inner circle of people with similar values, beliefs, circles and practices etc to strengthen oneself and one another so that we can extend ourt our hands and be kinder and open to people at different stages. This in itself is loving yourself first. Everybody needs their close team. Yeshua had his too. The only other thing I’ll add is I actually think its important to be proud of yourself and your accomplishments at the same time. We are dust and lowly creatures who see through a glass dimly but we are also made in the image of G-d and more than conquerors through Yeshua. We also live in a special time where our generation has seen the creation of the Jewish state and the renewed movements among st the Jewish people towards Torah & Yeshua. Its time to break the narrative of being the weak and accept our destiny of being the strong.